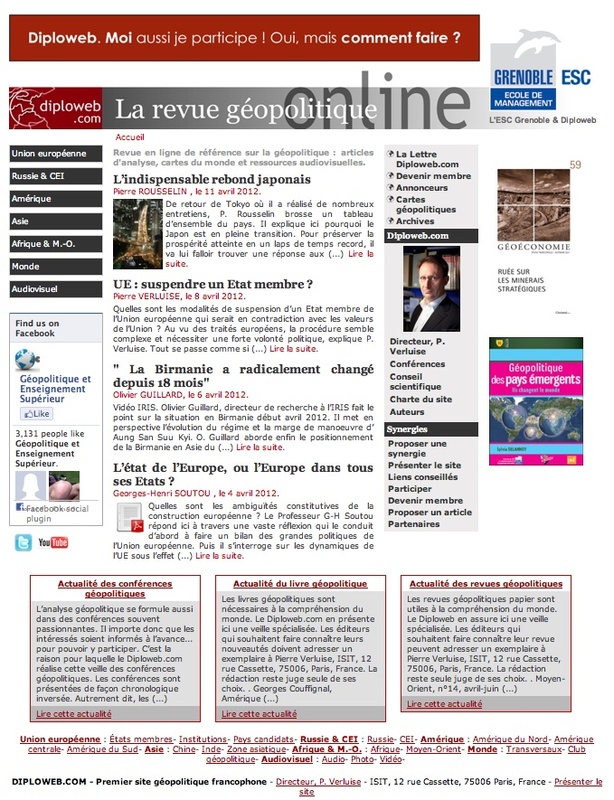 Created in 2000 by a geopolitics professor, recognized and supported by several universities and institutions, Diploweb is the first French-speaking website on geopolitics and international relations. Its research interests also cover the European integration process and EU enlargement, as well as Mediterranean migrations, politics and inter-state relations. Diploweb was launched as an online forum on these topics so that all material is provided in html and web standard formats. Its archive – since 2000 – contains papers, articles, essays, bibliographical references, full-text books and book reviews, maps, statistics, provided by academicians, diplomats, scholars and experts or collected from partner journals and reviews. Since 2008, a little audiovisual collection is also available. The website also gives direct access to other Diploweb sections (as its newly launched blog, its newsletter, its announcements) always fostering the user’s involvement and asking for support and membership. Access, search, browsing and material location for the general public is completely free. Many useful internal links are provided in the texts as well as to pertinent external resources for further research. The website is in French, but a smaller English version is also available. Search features are extremely simple and browsing may result the most effective way to retrieve material.